All you need to know about laminate construction. 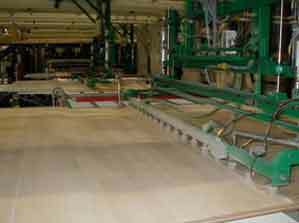 Learning how laminate is manufactured is easy and simple. We’ve outlined the basics below and ask that you read through them to better understand how this unique product is created. Knowing how laminate is constructed provides you with knowledge of laminate right from its beginning. That’s important information because these are the materials you’ll be living with and walking on for years to come should you choose this flooring product. Knowing laminate construction also helps you better understand and evaluate its performance aspects. So read on, and we’ll do our best to help you know how laminate is made, the various steps involved, and the reasons why certain processes are performed. In the section “Introduction to Laminate,” we told you laminate is a manufactured product that is a true look-a-like of hardwood flooring, natural stone and many other types of flooring. Now, you may be wondering, how can laminate flooring resemble these other products so closely? The answer lies in the process of how laminate is made. It’s a combination of the precision of today’s manufacturing techniques and the expertise of the men and women behind the materials, machines and methods that create laminate. All work in harmony to produce a beautiful, functional flooring that closely simulates other beautiful, functional floorings. To know laminate, think baking and a four-layer cake. Today’s laminate floors are available in a multitude of designs, patterns, and textures, yet they all consist of four main components that are bonded together. The next layer is a core board, generally made from high-density fiberboard or particle board which may also contain melamine plastic resins that help improve the moisture resistance of the core. 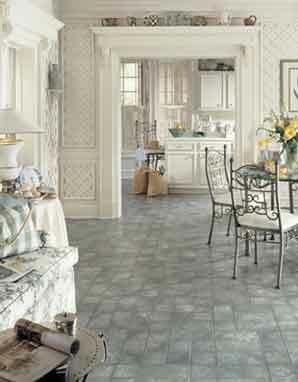 Then a decorative layer or print film is adhered on top of the core board giving the floor its hardwood or tile look. And the frosting? On the top of our “cake” is a durable wear layer, providing protection and stain resistance. Now many wear layers also contain aluminum oxide, as well as melamine resin, and that creates exceptional durability. The kind that will stand up to the most active household – even yours. All four layers of our “cake” are then combined in a high-pressure process. Now we’ll take you through the manufacturing process of laminate one step at a time. Step 1: stacking with electronic precision. The process begins with the assembly of the 4 layers of raw materials in large sheets. This typically takes place on a production line, where modern technology enables each layer to be stacked on top of another with incredible accuracy and precision. How precise you may ask? Most manufacturers use sophisticated electronic calibrating equipment and digital camera systems to keep the sheets in perfect alignment. The backing layer is first on the line, with the core board placed directly on top of that. Next, the printed decorative layer is stacked on top of the core board. The final layer to be stacked on is the wear layer. Step 2: now the pressure is on. Once the 4 layers have been stacked, they are ready for pressing. The presses used to create laminate flooring have hydraulic rams that apply tremendous pressure to the stacks. The stacks of layers are pressed at high temperatures reaching 400 degrees Fahrenheit, with up to 600 pounds per square inch of pressure for 20 to 30 seconds. 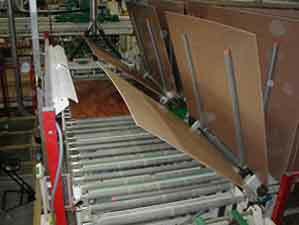 Manufacturers carefully monitor the time and temperature when pressing the layers to successfully cure and bond the stacks into a single sheet of finished decorative laminate. If the laminate that is being manufactured is designed to have a textured surface, the press has specialized plates that imprint the textured pattern onto the sheets, creating more natural looking planks or tiles. Step 3: a time out to cool off. After the sheets are pressed they are left to cool to ensure that they fully cure and to prevent any surface imperfections. Then the sheets are stacked and stored for a time so that they can continue to acclimate, thereby enhancing the stability of the boards. Step 4: planks, profiling and precision. 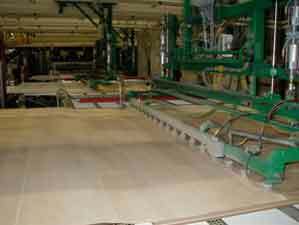 Once the boards are fully acclimated, they are milled, or cut into planks. The freshly cut planks then move on to be profiled. Multiple profiling saws create the tongue and groove edges on the sides of the planks that enable the floor to lock together with ease. The blades on the profiling saws use electronic and laser systems that produce incredibly accurate edges for a perfect fit. Further assurance of the precision of your floor. The finished planks then go through a quality inspection and are checked for color, texture, finish, size and correct interlocking capabilities. Once approved, the planks are then stacked, packaged and loaded onto trucks for distribution. Now that you know how laminate flooring is made you can understand why it’s a beautiful, durable and cost-efficient flooring answer for many homes, and homeowners, across the county.